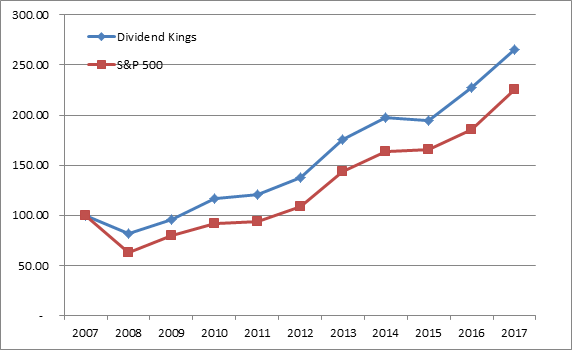 I am not going to name names, but I have seen articles on the internet which use the historical performance of today’s dividend kings to show their total returns over the past 20 – 30 years. This is misleading, because the current list of dividend kings was not known in advance in 1988 or 1998. That is an example of survivorship bias, which is misleading to investors. Since I am also a one person operation with a computer and a spreadsheet, I assumed that dividends were collected throughout the year in cash. Therefore, the performance at the end of the year consists of the difference in year-end closing prices plus the cash dividends paid during the year, relative to the closing prices from the preceding year. The number of dividend kings increased from 8 at the end of 2008 to 20 by the end of 2016. By the end of 2017, there were 25 dividend kings. You may review the current list as well as the evolution of the historical listings in this article. As a result of the process followed above, I came up with the following annual performance of the Dividend Kings List. Subscribers to my mailing list will also receive the spreadsheet that includes the information used it today's analysis. I then compared it to the annual performance of S&P 500 during the same time period. After going through this exercise, I would want to caution you a little bit. Please be aware that past performance does not guarantee future results. It is quite possible that the dividend kings do not live up to their potential over the next decade. Or, they could surprise everyone and deliver spectacular results in the future. Noone can forecast the future. While we can see historical results using past data, we can only have a rough estimate of what happened in the past. Be careful in projecting the past onto the future. While I am infatuated with the stories of each individual dividend king, that doesn’t mean that these companies are automatic buys today. Regular readers know that I review each company for a few characteristics such as growth in fundamentals, dividend safety and valuation. A long track record may pique my interest in researching a company. However, if it doesn’t grow earnings, or the dividend payout ratio is high or the valuation is obscene, I will walk away from this investment. - Where are the Original Dividend Champions today?